Louisville Boudoir and Pinup Photographers: Now Booking Pinup Photo Shoots in Harrisburg, PA Area! Now Booking Pinup Photo Shoots in Harrisburg, PA Area! You read it right! 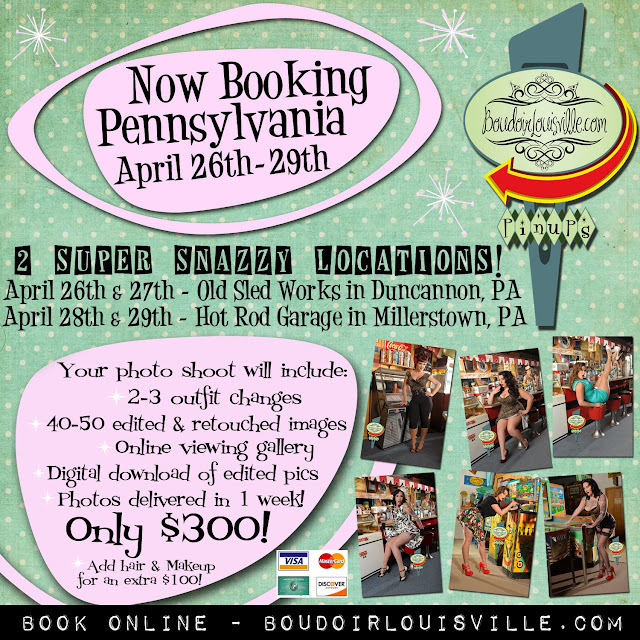 The Boudoir Louisville gang will be taking our little "dog & pony show" on the road again this April! We are currently booking shoots during Sledfest at the fabulous Old Sled Works! If you've never been to this place, you owe it to yourself to check it out. Literally the best antique market I have been to in the country. It's also my favorite photo shoot location, which is why we keep coming back! We are also booking pinup girl photo shoots at a privately owner hot rod garage in Millerstown, PA. This guy has such an awesome setup. Tons of great vintage stuff and super snazzy cars! Details for both shoots can be found below. *We are booking shoots April 26th & 27th 2014. *All appointments are one-on-one. We will not be shooting multiple girls during your scheduled time. *You will have 100% of our attention during your photo shoot. *All shoots will take place at a Old Sledworks, a super snazzy vintage soda shop and arcade just 15 minutes outside of Harrisburg. *The shoot location is in Duncannon, PA.
*We are booking shoots April 28th & 29th 2014. Book either or both shoots online! BoudoirLouisville.com!